No, I am not quitting woodworking, though we must all do that some day. 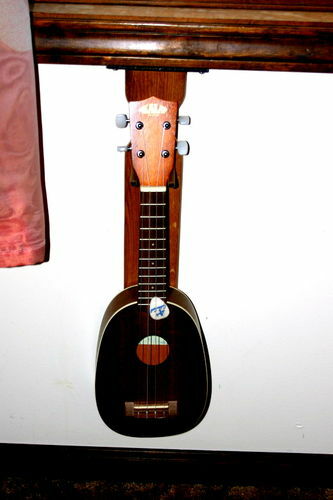 I am hanging up my ukulele on the wall next to the computer. Thanks for looking and a special thanks to those of you who leave comments or suggestions. I try to respond to all comments and look forward to that. 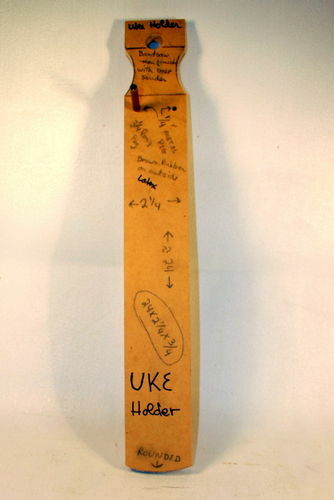 Pictured is a hanger for a ukulele. This quarter sawn White Oak board is 24” x 3 1/2” by 3/4” and has two 1/4” x 2 1/2” steel pins padded with with a section of 3/8” latex hose. I know it is not a box, but I wasn’t sure what other category to put it into. Story: This looks like a simple project, and it is. However, even a simple project has its complications. This tale starts out simply enough. I recently bought a ukulele and have been having fun playing it. The first step for me is always to think out the idea and make a sketch of the project with any dimensions I can think of to put on the diagram. Next I made a prototype and discovered my original design was too long for the space under the window. So I shortened it. Then the holes were too close together. So, I widened the space. Then the 1/4” wooden dowels looked too weak. So, I replaced them with 1/4” metal rods. 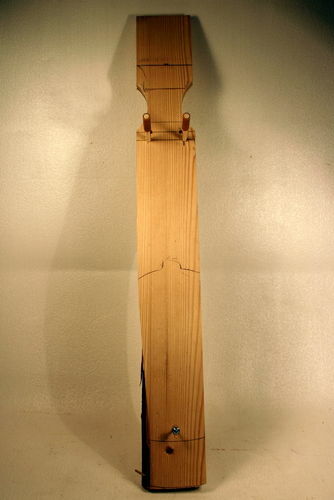 Then the tuning keys hit the hanger board and that wasn’t good so I took a small semi-circle out of each side. The top looked too long, so I shortened that. Finally I didn’t want to put any holes in the wall if I could help it, so I put a metal strip at the top and added four holes. Two screws go down into the hanger, two screws go up into the window trim. All holes are unobtrusive, and no holes in the wall. (That made my wife especially happy.) I learned a great deal from that first pine prototype. First version was made of White Oak I cut the shape, rounded the corners, routed the edges, curved the bottom, hand sanded all the corners so it looks like a used bar of soap and began the first of four coats of finish. Each coat takes a day or two to dry so I worked on the next step. Second version was made for my grandson so he can hang his uke in his room. So now I had made two of these. Then came the surprise. 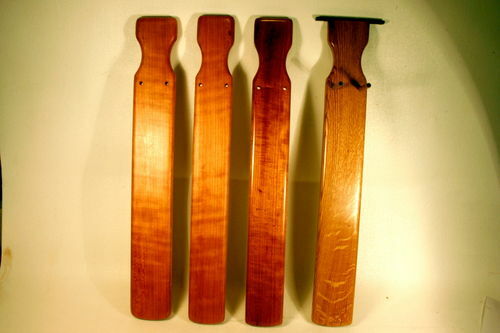 A couple of friends saw them and wanted to hang their ukes on the sides of their bookcases. 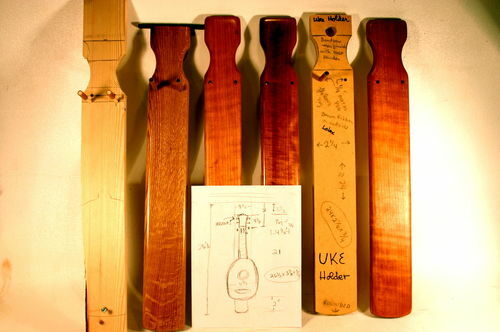 So now there was a market for uke hangers. Who knew? Since I was making more it was time to make a real pattern out of hard board. On the pattern I wrote lots of information like dimensions, lengths of pins, how to make the curves (band saw then belt sander). and sizes of holes. I’ll hang the pattern on the shop wall and have it ready for the next person who needs a uke hanger. Once I have a pattern I can make quick work of making another of these. I drill through the pattern holes for the pins and trace out the cut outs. The pattern eliminates all of the design and thinking time. Using the pattern I quickly made the last two hangers. Seems like quite a collection of material to make a simple project, but if I want to do it right and be able to quickly and accurately reproduce an item, I have to go through all of these steps. Now my trusty uke hangs right next to me. The best part is that everyone is happy. My wife is happy. I am happy. My uke is happy. Good solution and nice job describing how you analyzed the problem to work to it, Al. Nothing better than a happy Uke! Thanks for sharing this project! Good idea for a way to keep an instrument close at all times! Perfect solution to store your ukulele Bob and if everyone is happy it’s all the better! I like the how you made a pattern so you can reproduce them easily. Good work as usual! Dave, thanks. I actually like the process of designing projects and never felt comfortable with the “just wing it” school of woodworking. I too made a glue caddy. Fun to see yours. Mike, thanks. I probably wouldn’t be comfortable storing an expensive instrument this way, but for a practice instrument it is fine. Sounds like you have had some dealings with ukes if you can recognize the pineapple design. 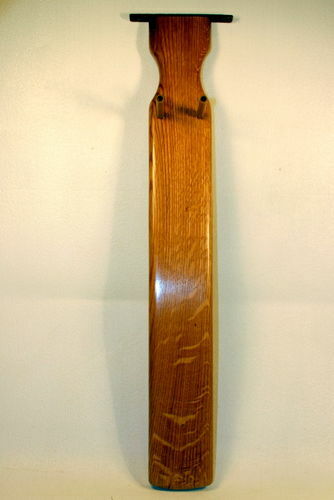 Your cribbage boards and other carvings are really impressive. Tony, thanks. If I were just making one of these hangers then a pattern would not be needed, but once it grew into four and possibly more, I think I got back the time it took me to make the pattern. Tony, I see you are up to 90 projects. Your games look great and are fun to look through. Scared me for a second…. Thats nice work. 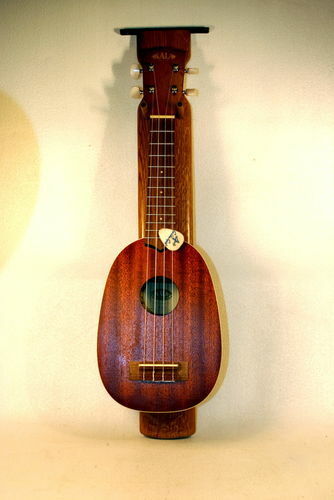 I’d like to make a uke or a mandolin someday. A different project but a wood project !! I have the same “desease ”!!! I work on the PC and I play electric guitar to change my mind…. My fingers have to be busy all the time !!! Thanks Doug, I do try to build even simple projects that have nice lines and feel good to the touch. I looked through your projects and was struck again with the elegance that you put in all your work. Mr. Wolfe, thanks. 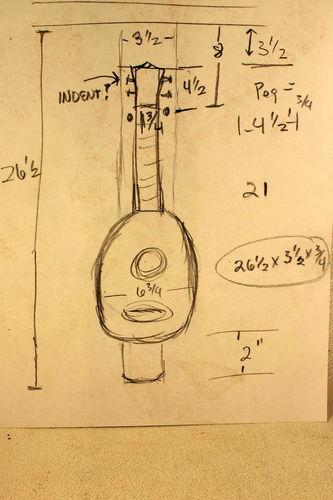 I have been slowly working up to making a ukulele. It won’t be a masterpiece, but it seems like an interesting project. I may start with a “kit from Stewmac.” Have you seen them? I looked through your projects again and was impressed with the clean lines on your builds. Digger, always nice to hear from you again. For me, busy hands are happy hands. Yes, leave it to a Lumberjock to make a woodworking project out of a ukulele purchase. I have been having fun learning songs on the uke. By the way, this is a great website to learn to play a ukulele At least is works for me. We’re very different, you and I, Al. I pretty much wing everything, and use hand tools. But I’m still learning, and half the fun is figuring out a solution after I’ve started down the wrong path. They say we learn from our mistakes, so I’m learning fast! But I’m also learning by watching guys like you. Dave, all of us work in different ways and I think minds work in different ways. My experience has taught me that it is easier and less expensive to make my errors working on paper and pine before I pick up a nice piece of cherry. Doc, I don’t know when spring will arrive. Last year grass planted in December thrived. This year we have had several inches of snow in March and frost in April. 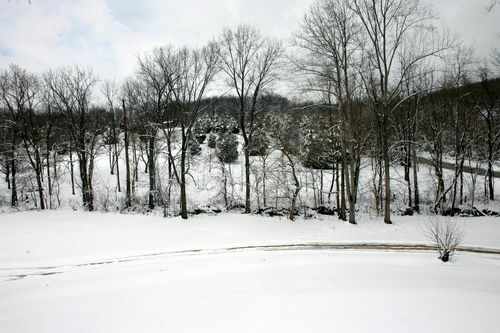 Since I bought an all-wheel-drive Toyota Highlander I can skip scraping off my driveway. That car has traction like a mountain goat. Taking all the steps I took to get the final results seems like the long way around the barn, but it is how I work best, and it lets me produce high quality products that I can sell. If I were just making something for myself I might be less careful. Always good to hear from you, Doc. That’s a great walk-through of the conceptual part of what would otherwise appear to be a relatively simple project. We all have tons to learn from you! Tony, thanks. I wasn’t going to post this project, after all it is just a board with a couple of metal pegs. However, I hoped that the process would be instructive to my fellow woodworkers. After I had finished a couple of these, I looked at the drawing, prototype, first version, second version, pattern, and last two hangers and thought that this would be a good project to illustrate the process. I had a story worth telling. I have been thinking about building a version of this that functions as a floor stand. So it is back to the drawing board for me. Ian, thank you very much for such kind words. It is comments like yours and encouragement from others that keeps me at this. Keep building and keep posting.